Do you need to pay a premium for the best tasting ice cream? Isn’t it a factory produced product? Albeit to Maggie’s recipe, and with her sponsorship and endorsement? It must be difficult to reproduce the exact same product any chef produces in single batches by hand, fresh for their restaurant customers? The result though is still a surprise! The Woolies vanilla is pretty good especially when serving to the masses at a party, most can’t tell. 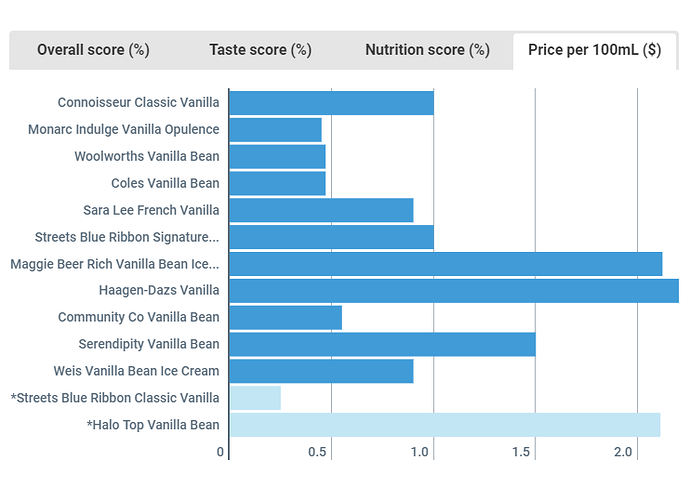 We don’t normally buy premium vanilla, but buy a lot of other flavours of the premium brands, mainly when they are on sale for half price. We’re not usually disappointed except for the ones with the donut pieces in them. I bought Streets Blue Ribbon recently. I used to like it. It seemed different this time round (or my tastes have changed). I now prefer Coles basic vanilla at half the cost. Did you find it more fluffy? I did. Too much air in their product. I use Peter’s No Added Sugar Low Fat Ice Cream which tastes VERY good in vanilla, no good in caramel. It’s amazing it tastes so good! Did you find it more fluffy? “It”? Not sure which you mean. Sorry to be ambiguous @SueW. I was referring to the Streets Blue Ribbon ice cream you no longer like. In my opinion, it tastes more frothy and less dense than it used to be. Whilst both my grandmother and my mother were great cooks, I never liked the ice cream that they made, and my favourite was the soft serve ice cream from a long gone cafe in the Cairns CBD. They would dip the cone of soft serve ice cream in melted mint chocolate which immediately solidified and then prevented the ice cream melting and running down the side of the cone. These days we buy Sara Lee and Connoisseur 1 litre tubs or vanilla or double chocolate when on sale, which I sometimes eat but which my wife eats regularly. I cannot believe that anyone is prepared to pay $12 for a measly 458 ml tub of Ben & Jerrys or $11.50 for a measly 457 ml tub of Haagen-Dazs. Many things are hard to believe! We don’t place ice cream on a pedestal with any degree of fever. Belief does not come into it. It’s just another small pleasure, slightly less satisfying than a 700ml Islay single malt. One tends to last longer than the other around here. However over indulgence of either may not be good for your health. There is food science as to why soft serve ice cream is preferred by some. How it is produced makes it appear whiter (marketing purity), uses less milk fat (Lower cost of ingredients), and due to the added air (free ingredients) has a smoother and creamier texture. One view is soft serve is just like regular ice cream that has been watered down and fluffed up. Almost good enough for a shonky? Or it should be one third the price? My gran would have agreed - “you are not wasting your money on that rubbish now are you?” It helped to just smile and nod knowing a Choc Top at the movies was the only way to go! Ahh, OK. NO, thats not what I found, I thought it was kinda thick and tasteless. Might try Bulla next time, I cant recall ever having that but I always like their frozen yoghurt. My wife’s late mother always asked me to get Bulla vanilla ice cream for her when I did her grocery shopping. I don’t know if she preferred the taste or whether she supported Bulla as an Australian owned company or both. Maybe you can’t tell the difference between vanilla ice creams, but I definitely think it is worth paying a premium for more interesting and imaginative flavours (e.g. where there are add-ins such as chunks of chocolate, swirls of lemon curd etc). At that point Blue Ribbon no longer competes for me, even though I agree its vanilla flavour is pretty good. I’ll have a pint of Laphroaig please. Streets Blue Ribbon non-ice-cream doing so well just shows what chemicals can achieve these days. Surely an ice cream test should just include true ice cream though? Labelling should ensure that the consumer gets what they pay for. In this case (if we accept the judgement of the panel) it has the collateral result of leading to products that are less value for money. Which is more important? Good news. Coles have 2 litre tubs of Bulla on special at half price. Thanks for this test, Choice. Our household looks forward to sampling the Woolworths & Monarc. We did several tastings some last year in a country where Vanilla seems the least available. The going rate for Haagen dazs was A$5-6, & it & Ben & Jerrys were the only recognizable brands. Never saw a B&J standard flavour, so mostly HD tastings. Belgian Chocolate was the fav. HD certainly tastes very creamy and dense. Seems to have a longer mouth feel than the Streets ice “foam” we have in the fridge. Did Choice notice any relationship with density? Could Choice add the $/g rate?